"You can be active with the activists or sleep in with the sleepers while you're waiting for the Great Leap Forwards"
Were they sleeping? I guess that many people were wondering "Whatever happened to McGillicuddys?" This Canadian band released a great album in 2003 and we have been waiting for their follow-up for a long time. In fact, seven years have gone by till the release of "Sin Lane". It was high time. I must admit that I love these guys. A band clearly influenced by The Pogues which is not a wannabee band (just listen to tracks 3 "Thinking of You" and track 6 "The Siren's Drone"). Besides, this time they cover The Nips "Gabrielle". Maybe McGillicuddys are not among the Celtic Punk Music Gods, but that accordion and that tin whistle haunt me. I can hear echoes from bands such as Jimmy George, the earlier Pubcrawlers or even The Skels or Mutiny. 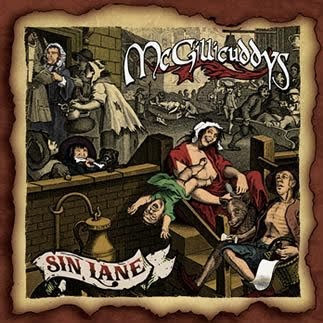 However, the sound is clearly "McGillicuddys"
I hope that the gap between "Sin Lane" and their third album will be less than two years. Canadian bands such as McGillicuddys show us how good this genre is. We want more and we want it now. Another Great Leap Forwards.